I am almost, but not completely, compelled to camp next to this chokecherry (?) tree in my front yard to watch the birds (juncos, etc.) strip the tree and come back time and time again. Last year I saw the flock of birds that stripped the tree and identified them, but I did not write down my observations, so, here I go again and I will record this time. I write this nature post and I do not have either bird or berry tree identified. But, so, I adore berry and bird regardless. By the calendar it is January 7, 2010, and I am in the pickup, near the barn. 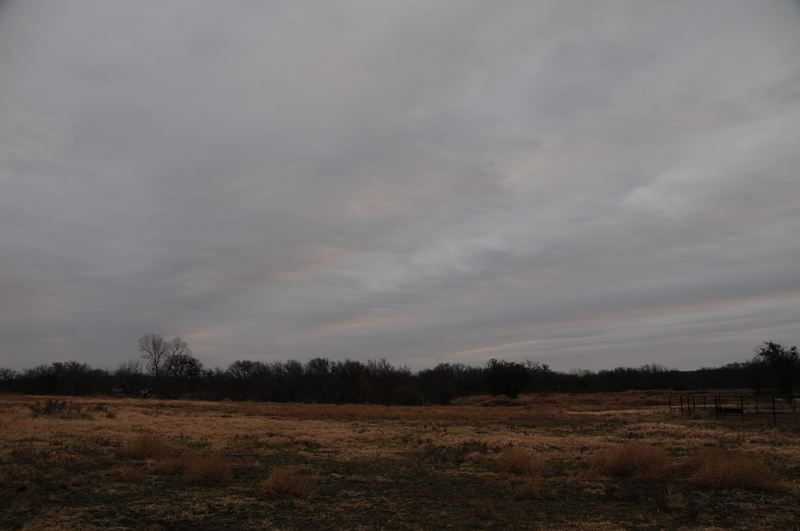 Looking east from the Well House corral in south Poprock Hill pasture, the early morning sky configures a cold day for livestock and young men and women on horseback who manage them. Currently, we have no cattle herd to tend, but five horses need our daily attention. I rose early before daylight and planned the first feed of the day for Lilly the oldest mare and alpha, Star the gelding-son of Lilly, Sweet Hija the King Ranch legacy mare, and Shiney the colt of Sweet Hija. Presently, I do not tend the fifth horse. The fifth horse is off-site, at Duncan Steele-Park’s place near Weatherford, Texas, going to school in the round pen of equine education. 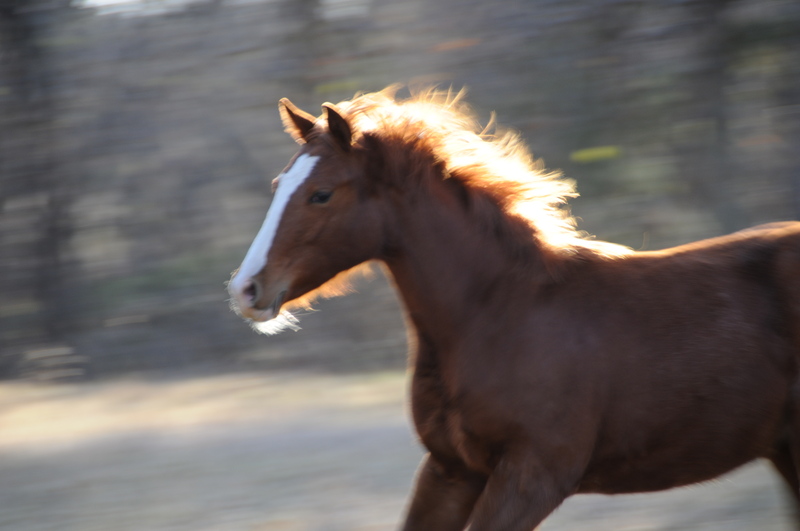 This horse, Fanny, is with ten others in her cohort, learning and gaining confidence to join-up and toil with cowboys and cowgirls that must use horses that are strong and even-tempered. Duncan has a philosophy about horse training. Before we even unloaded Fanny from the stock trailer, he stated his way of working with young horses. Duncan grew up in Australia and his methods presage directness, no frills, no nonsense. He spoke clearly, precisely, in clipped tones of the Down Under, and with the authority of a thousand rides upon young horses needing guidance to confirm man as a friend, not predator. The most important lesson you must teach a young horse, who is having his first few rides, is to go forward which is why I don’t spend much time in a round pen because there is no where for a horse to go in an arena. I find myself a fence line or a lane and kick the latch of the arena open and let my young horse just run. You see if you leave a young horse’s feet free you keep his mind free. And if things are getting a little radical, just one-rein stop him and then let him go and before you know it he begins to relax. People and clinicians now days take too much of the impulsion out of young horses because they spend too much time doing groundwork [in the roundpen]. I think I’ll play with Fanny this afternoon and see what she does . 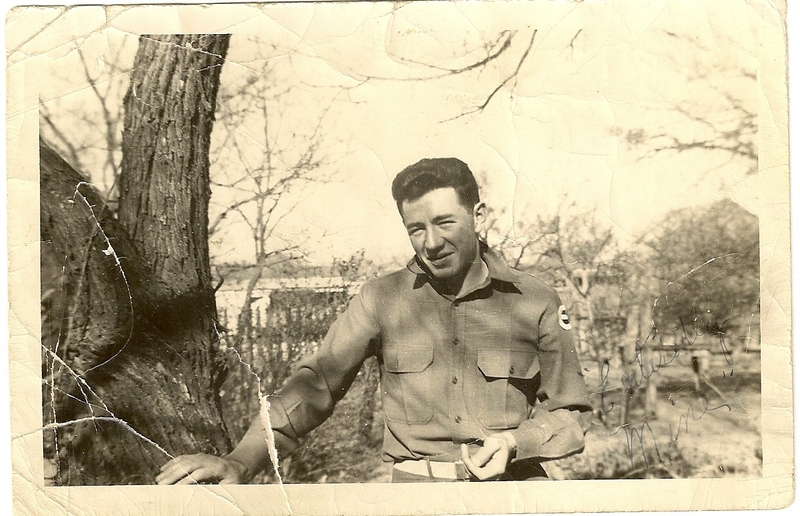 My grandfather, J.W. “Jake” Parks trained or as they used to say, “broke” horses. My mother told me that her father would use a forceful technique to train horses and that the “screams” of the horses upset her as a child and caused her to resent the method Jake used, even Jake. My grandfather did not have a coarse or abusive nature; he loved jokes and took my mother and his sisters fishing along the Colorado River. He was, unfortunately, taught to use the aggressive method by his teachers and peers; that was what he saw in the 1910s and 1920s in central Texas. I think if my grandfather had seen another method to train without force, he would have used it. Those methods were not present in his background, although the method of respectful, non-forceful training has been around in recorded history since Xenophon, the Greek cavalry officer, 5th century B.C.E. General Stephen W. Kearny who marched American troops through New Mexico to California in the Mexican-American War, 1846-1848, reportedly used non-abusive techniques in handling horses. My grandfather probably never knew Xenophon’s way or Kearney’s. He was, like us all, a man of his times and it ended badly. In the 1930s, while working on the Sorrel Ranch in Sonora, Texas, my grandfather was critically injured riding a horse named Hell’s Canyon as they popped brush for cattle. Riding fast, he struck a low-hanging tree branch and was knocked unconscious. Unfound for three days, he almost died before ranch hands rescued him. He never regained his health following the accident. I do not believe Hell’s Canyon delivered a mystical counterforce to Jake, re-aligning balance to horse screams and my mother’s pain, but rather the accident came as both horse and rider delighted in the chase of cattle for round-up. The story of my grandfather and Hell’s Canyon was heaped on me when I was a child and I was told I favored my grandfather in body, but I never saw him. In the family narrative, horses and and my grandfather were always joined, wedded, symbiotic, tragic. I was never expected to follow my grandfather’s path. That was just as well because I grew up in a small town, my country experiences were inconstant and we had no land, no cattle, no horses. Time passed, I inherited horses, my grandfather’s inheritance was passed down to me and I bought more horses, good horses, fine-bloodied, and beautiful. I bought land and I began to work with horses without force, without pain, and with respect. And, when it is time, I take them by the halter and give them to a teacher who will help them grow in ways that take them to high places, wind-swept and sunlit that call out their strength and delight to help tend livestock with humans in the West. Duncan Steele-Park has a fenced lane, about fifty-feet wide, that angles from his round pens into the Texas brush and trees and pasture. Though I have not seen it, I know where the lane ends. I can tell you where it begins. For the horse, the lane begins with respect and it must end in a land of fun with Duncan Steele-Park. Jake would be pleased; he would be changed. Conversation of Duncan Steele-Park to Jack Matthews, Weatherford, Texas, December 22, 2009; email of Duncan Steele-Park to Jack Matthews, Weatherford, Texas, January 8, 2009. I let them gain a confidence before I ask anything of them. Some trainers just put them in the round pen and round and round they go, boring them and not letting them be. What I do is let them go down the lane, down the lane, learning for themselves and gaining confidence before I ask anything of them in the round pen. Then as they go down the lane, after awhile I ask something of them in the round pen. As you can read, Duncan’s correction of my recollection carries specificity about training that my later recollection did not. His words have greater clarity about his philosophy and present his training style in definitely his own words. I can hear in his writing, the down-under Australian accent. Duncan Steele-Park’s email address is duncansteelepark@yahoo.com. This is a narrative of how my ranchito in Texas is called, “The Flying Hat,” and of special places on earth that evoke attachment and meaning in an ineffable way, be it Gorman Falls or Estes Park or Truchas Peaks. Gorman Falls is located in San Saba County, along the Colorado River, downstream from Bend, Texas, and above Lake Buchanan. Since 1984, Gorman Falls has been managed, fortunately, by the Texas Parks and Wildlife Department. An artesian spring, ejecting about three-hundred gallons a minute, provide hand-cramping cold water for the falls. When wading in the water, legs cramp from the cold. Water cress grows naturally along the stream. The spring is about one-quarter of a mile up from the falls. The sound of the waterfall is loud, a low roar, back down by the cliffs, as you walk under a canopy of sycamores, cottonwoods, and pecan trees that give shade, plunging the ambient temperature ten degrees or more. The temperature change is so vivid, it is like opening the refrigerator in the house after working outside in the heat. It is no wonder that the Comanche, the working cowboys of the Gorman and Lemons Ranches, planned their day to be close to the falls when toil eased at mid-day or stopped in the evening, so that the cool air and artesian water might ease their muscles or give good medicine to the tribe. I know of these things, maybe not the Comanche camp, by listening to my grandmother who tended the chuck wagon for her husband who managed cattle for the ranches. My grandmother, Effie, took me to the falls many times, always pointing out on the downhill slope to Gorman Falls, “That’s where we camped and set up the wagon, built a fire right there.” And, I would look and see bleached rocks and junipers, a clearing in the trees, and, yes, the remnants of a fire, her fire, many layers below. I thought of the cowboys who herded cattle, sitting down and eating beans, cornbread, and beef that my grandmother cooked. She was not that tough of a woman, of a person, to fix grub on the ranches, but she did. She followed my grandfather because she loved him and would cook for him and his pardners, as they tended cattle in the blazing hot, anvil-hard earth, Texas sun. Gorman Falls, with its cool, artesian water, was Beulah land, paradise, relief beyond belief, for them, for me. I have camped many times under the sycamores at Gorman Falls, but the time I remember the most was in 1951, when my grandmother, Effie; my stepfather, J. W. Hollingshead; and my mother, Gywn, drove to the falls for a picnic. I was nine-years-old. My step-father, J.W., had an old gray, felt hat that was soiled and very, very ugly. My grandmother had teased him for months to get a new hat and throw his old hat away. As the four of us chatted under the shade of the trees and cool air along the stream, my grandmother proposed to my stepfather that if he would throw his old hat over the waterfall cliffs, she would throw her bonnet over the falls after his hat. But, J. W. throws first. It was an ugly hat. Smiling so broadly, my stepfather walked to the edge of the falls and threw his hat over the cliff, the wind and mists of the water catching it, holding it, and then settling onto the trees below, never to be seen again. And, with that, my grandmother, grinning and chuckling softly, walked to the edge of the falls, unpinned the hat from her hair, and threw her hat, a yellow, broad-brimmed hat trimmed in wide black ribbons, into the air and it, too, settled with the mists of the falls onto the trees below. The hats flew, suspended, they flew. We all laughed and I, to myself, admired my grandmother for creating an event that took us beyond our scarce resources as a family, the jobs under good, but insensitive bosses, to a place that transcended our daily duty, our toil. Yes, I laughed, too, but I was a witness, a boy looking at his gods, knowing something, but not understanding everything they did. Time is fleeting. I grew. They worked. They played, they loved. They went away. My grandmother passed in May 1965, my stepfather in December 2002, and my mother in April 2003. In November 2003, I purchased land near Mingus, Texas, from the inheritance of my family. I named the place, The Flying Hat. 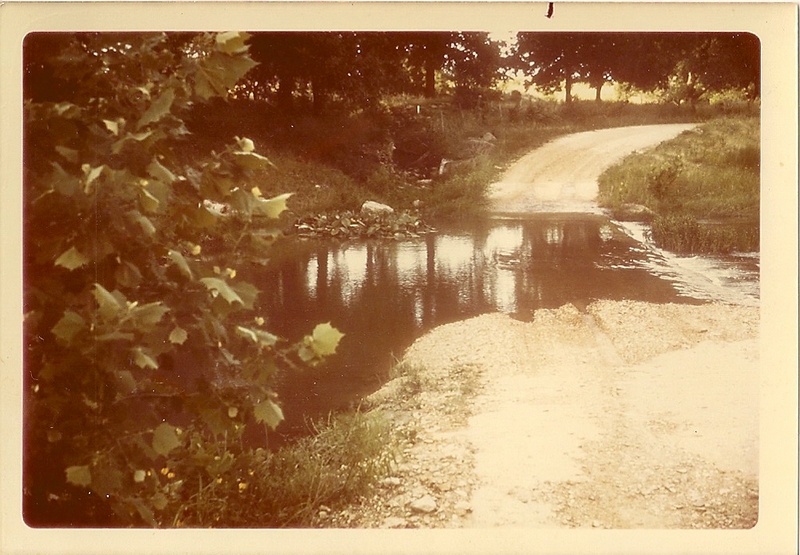 That would be the best name, a time when all four of us were laughing: my grandmother, stepfather, mother, and me, beside hand-cramping artesian water, under sycamore trees, as flying hats settle onto trees below. These days, my granddaughter and I deliberately throw our hats off the terrace of our ranch house to amuse ourselves, but we know, deep down, the flying hats over Gorman Falls, Texas, flew first. Portions of this post first appeared on The Flying Hat Horses website, several months ago. The “About Us” page on the website is currently being revised. The Colorado Bend State Park has infrequent field trips to the falls. The Colorado Bend State Park, however, is open to campers and fishermen. 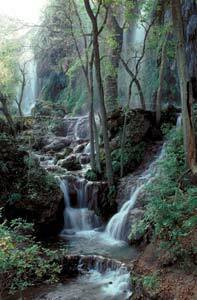 I visited Gorman Falls with my grandmother and relatives when it was under the supervision of the Lemons and Gorman Ranches (I’m not sure which ranch). Being privately owned, it lacked meticulous cleanups, having certain debris trails along the Colorado River bank and artesian stream. Despite that, the greenery around the stream was composed of ferns, some native. I would like to go back and type the plants, especially the water cress, since my grandmother fixed a salad one time beside the stream by harvesting the cress. I stated in the post that the temperature would fall ten degrees. I have not taken the ambient temperature under the the canopy of trees, and I will correct my post if I have more data. The fifty-three acres I purchased was with the inheritance I received from Effie, J.W., and Gywn, so I thought it proper to pay some respect by the naming, Flying Hat. This fifty-three acres in Erath County is combined with thirty-five acres I share with my cousins in Mills County for a total of eighty-eight acres. Living with eighty-eight acres is a soothing and fiery experience. John Wesley Powell, in the nineteenth century, wrote that in the West a ranch should be comprised of at least 2,560 acres, so as to sustain a profitable operation. Today, a lot of us in the southwest, have much less than 2,560 acres (four sections, English township nomenclature), but we have jobs to supplement our income and a passion to live with the land. My grandfather, J.W., who helped manage the Gorman and Lemons Ranches, worked at times for the Santa Fe Railroad, to supplement his income and to save some for his own ranch.